The United States wants to pivot to Asia, but the Middle East keeps getting in the way. Likewise, India wants to pivot to China, but Pakistan keeps getting in the way. Pakistan matters to India for two primary, interconnected reasons: its home-grown terrorists and its nuclear-weapon programs. The pathway to crisis and war on the Subcontinent begin with the actions of violent extremist groups based in Pakistan. As long as this pathway remains open, deterrence stability does not improve with nuclear modernization programs. Instead, stability is dependent on Indian restraint after severe provocation. The nuclear competition between Pakistan and India now qualifies as a serious arms race. Since the 1998 tests, when both expressed fealty to credible, minimum deterrence, they have flight-tested fourteen types of nuclear-capable missiles. Both countries have embraced cruise missiles and sea-based capabilities. Pakistan advertises its short-range Nasr missile as being nuclear-capable. If Pakistan’s military leaders have established a requirement for a nuclear-tipped Nasr, they could employ the same logic to produce other types of battlefield nuclear weapons as well. Both countries have recently flight-tested longer- as well as shorter-range ballistic missiles. India can now reach targets throughout China. Pakistan can reach targets in all of India – and the Middle East. India and China have the means to place multiple warheads atop some of their missiles and to deploy limited ballistic missile defenses. The flight-testing and induction of MIRVs, even on a small scale, would have ripple effects in Pakistan, as would the deployment by India of limited ballistic missile defenses. Since the 1998 tests, India and Pakistan have fought one limited war, experienced one crisis sparked by an attack on the Indian Parliament building that triggered full-scale mobilizations, and another crisis resulting from a mass slaughter in Mumbai. It’s been seven years between crises and seven years since the last crisis. There has been no progress on the diplomatic front, no movement to resolve the Kashmir dispute and no agreement to set it aside. There has been no significant increase in direct cross-border trade, and still no direct trade between Karachi and Mumbai. The last nuclear risk-reduction measure negotiated by India and Pakistan was in 2007. Government officials in India and Pakistan seem unable to ameliorate the arms race unfolding on the Subcontinent. New Delhi is troubled by China’s strategic modernization programs. Initiatives to improve relations with Pakistan are hard to pursue when the “mastermind” of the Mumbai attacks, Zaki ur-Rehman Lakhvi, receives a get-out-of-jail-free card. Prime Minister Nawaz Sharif finds it hard to take initiatives with India that his military leadership opposes. All of which means that not much has changed with respect to the causes of potential conflict on the Subcontinent since the 1998 tests. But much has changed with respect to the consequences of potential conflict, given the enlarged and diversified nuclear arsenals now in place. 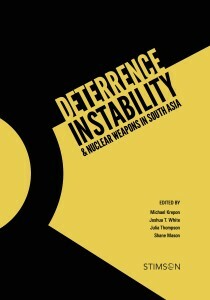 The Stimson Center has published a new collection of essays, Deterrence Instability and Nuclear Weapons in South Asia, to call attention to these developments. China figures prominently in these pages, but our focus is on India and Pakistan, where the potential for conflict is greatest. The nuclear arms competition between India and Pakistan spells trouble ahead – especially in the absence of sustained, top-down efforts to improve ties. The circumstances for another serious crisis between India and Pakistan remain in place. The Pakistani military’s laudable counter-terrorism efforts in the tribal belt will garner no sympathy if the Lashkar e-Toiba or another Punjabi-based group carries out spectacular acts of violence against India. In this event, all eyes will be on Prime Minister Modi, who is a “decider” rather than an agonizer, like his predecessors. He may decide, as A.B. Vajpayee, Sonia Gandhi, and Manmohan Singh did, that India’s economic growth is of paramount importance and that it’s not worth fighting another war with Pakistan. In which case, Pakistan would once again lose while India continues on its path of accumulating power. Or he may decide to hit back, in which case both Pakistan and India could lose quite a lot. What would a peace agreement between India and Pakistan look like? How do we get these two countries to move past all the excuses for why they can’t or won’t make peace? Another important concern is the nuclear winter phenomenon as applied to regional nuclear war. Research in the past 10 years suggests that even a “small” nuclear war between India and Pakistan could kill 1-2 billion people worldwide. These deaths would result from starvation because of reduced food production due to the global cooling impacts from dust and smoke kicked up by the burning of cities. This most recent research has been performed by a rather small group of scientists. Is there a way to enlarge this group of scientists and to motivate additional scientific research in this area to verify or critique these alarming research results? —Could you, Micheal, draw up a graph showing the difference between an ‘arms race’ and a ‘modernization’? As I remember it, the government of Turkey, years ago, received an arms transfer of M-16A1 model rifles. Today, the M-16A4 model is the standard rifle for the Marines. If modernization occurs between rivals while numbers do not go up — or actually go down — I do not consider this arms racing. If states with nuclear weapons decide to replace old nuclear weapon delivery vehicles which reducing launchers, or if they refurbish some warheads while contracting their stockpiles, they may be guilty of some things — like spending money poorly, or not moving quickly enough to fulfill their Article VI obligations — but I don’t think this makes them guilty of arms racing. If, on the other hand, rivals flight test new nuclear weapon delivery vehicles — lots of them — while increasing their number of launchers and warheads, this qualifies as arms racing — at least in my view. Are the politicians in India and Pakistan level headed enough to agree with you, or would they see an arms race where one was not happening? Indian and Pakistani leaders do not acknowledge an arms race. There is a huge historical baggage to this conundrum, one that cannot be weighed in lightly. Kashmir dispute is merely a symptom of the deeper ills, the mistrust, the religious divide, the anger of having been on the wrong side of the bargaining table during partition in 1947 etc. Sitting here in India, I am saddened by the spectre of war between people who once called each other brothers and knowing that circumstances get more conducive for war between the two countries, every passing day! Combining this post with the one next to it, how about the Humanitarian Initiative movement? Are they looking at the effects of a war in South Asia? Michael your response on Arms Race/ Modernisation hinges on Turkey’s modernisation of the M1 Rifle. Would you care to elucidate on US & Russian so called “modernisation” & the billions being spent by the US & Russia nuclear arsenal & the effect on deterrence stability? Your focus on South Asia loses its sheen in view of the larger picture. All states possessing nuclear weapons modernize them in some fashion. As noted above, the U.S. and Russia are modernizing while reducing slightly. India, Pakistan and China are modernizing and growing. I had the opportunity to attend a talk by Dr. Narang recently, and found his arguments about the inherent instability of deterrence in S. A. extremely convincing. We’ll have to see how things play out, but one of the central points I came away with is that Pakistan’s ‘asymetric’ strategy of deterrence allows them more freedom of action; the ball starts in the madman’s court, so to speak. We can only hope that Pakistan’s leaders continue to take their medication. No mention of India testing submarine-launched ballistic missile (SLBM), Arihant-class nuclear-powered ballistic missile submarines SSBNs and heavy investments by indians in Indian Ballistic Missile Defence Programme all of which are designed to give india upperhand, therefore increase chance of arms race between two countries.